Ararat Rural City Council’s vision for a major centre for the arts is a step closer to being realised, with the project reaching another major milestone. A crane lifts the pre-cast concrete panels into place. 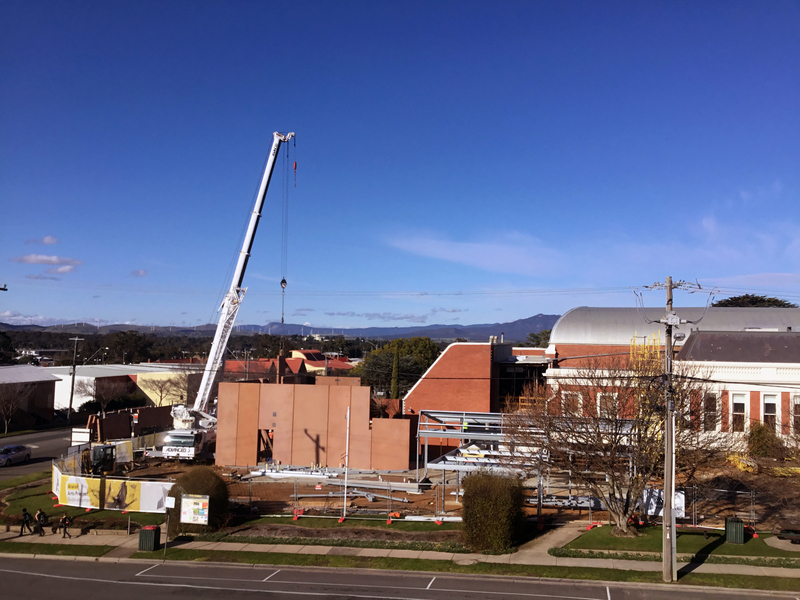 Pre-cast concrete panels were carefully maneuvered into place early last week marketing the new gallery and gallery store spaces within the redeveloped arts precinct. Ararat Rural City Council Mayor, Cr Paul Hooper said that with the panels in place, it was possible to get a sense of how the new spaces would ultimately look. “To date, there has been a lot of behind-the-scenes work at the site, with partial demolition and underground works happening,” Cr Hooper said. Councillors and the Project Control Group toured the construction site earlier this month. Cr Hooper said the tour provided opportunity to inspect the iconic Town Hall and the Performing Arts Centre mid-way through the 18-month construction project. When complete in autumn 2018, the revamped arts precinct will include a larger art gallery, an improved Performing Arts Centre foyer, box office and bar area, new café, more storage and a green room. Cr Hooper said the project architects, WilliamsBoag, had drawn on community input overlaid with architectural drawings dating back as far as 1895. “This is one of the region’s most recognisable buildings and whilst we have an eye to how it will be used into the future, we have been very careful to respect its history. The Ararat Arts Precinct redevelopment has been funded via a partnership between the Victorian Government ($5.2 million), the Federal Government’s National Stronger Regions Fund ($945,000), the regional community ($100,000) and Ararat Rural City Council.